I have been meaning to post this for awhile, but it got a little lost in the back log of email from when I was on two weeks of Jury service. 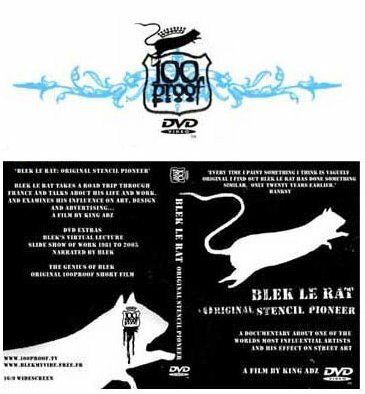 The Blek Le Rat: Original Stencil Pioneer film produced & directed by King Adz for 100proof Films is now available to purchase over on the 100proof website. Blek le Rat is the inventor of modern stencil art. He began his quest on the streets of Paris In 1981 and many artists (most famously by Banksy) have been influenced by his unique style ever since. Street art has evolved and the year is now 2006. Blek and filmmaker King Adz depart on a road trip through France to witness Blek's influence on street art and the modern media. The two men are friends off-screen, and Adz just lets the camera roll. To view some of Blek Le Rats stencils check his site.